All going to plan, mid 2017, two rather swish three-bedroom homes will be going under the hammer in Invercargill. The aim, to raise funds for Breathing Space Southland Trust's night shelter for the homeless. The vendor? 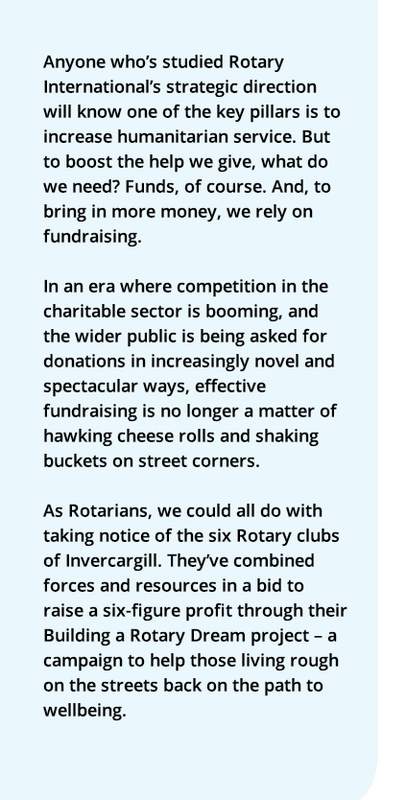 The Rotary clubs of Invercargill: Invercargill, Invercargill South, Invercargill East, Invercargill North, Invercargill Sunrise, and NRG. The mission? To raise upwards of $150,000 to $200,000 for the Breathing Space Southland Trust, which oversees a night shelter established in 2013 for Invercargill’s homeless. The auctions’ proceeds will go toward bolstering the services and support offered to those who seek shelter, including funding food, education and counselling. 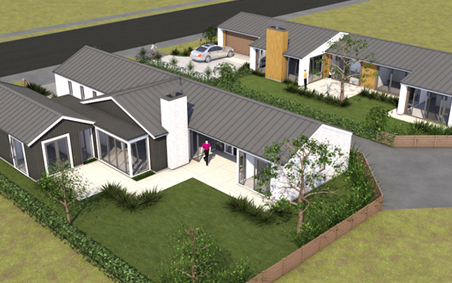 After months of brainstorming, planning and fine-tuning, construction is set to get underway later in the year on the two architecturally-designed homes, situated in Invercargill’s highly-sought-after Grasmere subdivision. The brainchild of Rotary Club of Invercargill North member Richard Boyde-Manson, Building a Rotary Dream follows similar projects elsewhere, but is understood to be the first time Rotarians have tackled building and auctioning two homes at once. He says rather than focusing, as has been traditional, on Rotarians providing many hours of unskilled labour – often for modest returns – this project was founded on the basis of members helping within their skill set. It’s structured so other jobs can be completed by other professionals, when there’s no-one available within Rotary, to ensure a high-end finish and maximum returns. Richard says, with the market very much front of mind, the homes have been carefully designed by Roger Beattie, of Beattie McDowell Architects, to combine practicality, functionality and aesthetics. Once the work on the 230.5sqm and 216.5sqm houses is completed, eight weeks of open homes are planned to showcase the properties, before they’re auctioned midway through next year. Both designs are quite unique to each other, and other homes in the popular new subdivision, which is owned by Rutledge Developments. As its name suggests, the Breathing Space Trust was set up to provide short-term shelter to those in need – some “breathing space” to give them and other agencies and services an opportunity to put in place longer-term supports to get people back up on their feet. While the numbers can fluctuate, Richard says it’s thought hundreds of Southlanders are homeless at any one time, for widely-varying reasons, ranging from job loss and mental health issues to domestic violence. And, the greater the Building a Rotary Dream’s success, the greater the impact for those in need. To boost the profits, the Rotary clubs are calling out for labour and materials, calls that are increasingly being answered by businesses and individuals, eager to get in behind the project. The beauty of such a high-profile project, Richard says, is the positive publicity that’s shining down on all who are involved and backing the project. He’s also hopeful the innovative project’s profile will create added interest in Rotary, and what the organisation can achieve, leading to more people wanting to join.